For the past few months, there have been some earnest discussions on whether Islamic Banking is operating under the right model or type of institutions. Comments by prominent scholars on the suitability of certain Islamic contracts in a financial institution sparked debate on the types that are suitable for operating Islamic contracts. Before I attempt to also put my piece in the mix, there were also questions asked to me on which of the existing models can actually be the right fit. There is still confusion on the types of institutions operating in the market. Before we look deeper, it is worthwhile to recap the available models in Malaysia. We have to start somewhere. Islamic Windows as a starting point, provides the best opportunity to build capabilities at the lowest costs while the business is being developed. The intention is to identify the requirements for system and invest minimally to assess feasibility and operational gaps. This allows the Bank to build the infrastructure at an acceptable pace. This is also a pre-cursor to further/larger infrastructure investments if there is a decision to expand the business into a subsidiary. This model relies on the existing conventional infrastructure where all the processes, operations, sales, channels, finance, branches, compliance, audit and all functions are provided by the conventional bank. It is a leverage model where the Islamic Banking Windows are more like a “manufacturer” of products. Islamic Banking Windows churn out the products and services (like a factory), and delivers them to the conventional team as part of the suite of products offered by the conventional bank. In such structure, Islamic Banking Windows are just a “segment” of products on offer. Just like Corporate Banking products. Commercial Banking products. Wholesale Banking products. Private Banking products. Retail Banking products… and Islamic Banking products. The advantage of this model is the low set-up cost. The business rides on existing infrastructure and hires specialists in each function. There is no need to set up a different branch as those Islamic products are sold directly by the existing branches and channels sales team. Balance Sheet discloses Islamic Banking Window performance as part of the Notes to the Account. Shareholders’ Capital, however must be separately allocated, accounting ledgers managed separately and the Single Customer Exposure Limit (SCEL) will be 25% of the allocated Capital. A head of Islamic Banking Windows will report directly to the conventional banking CEO, where business decisions are made. 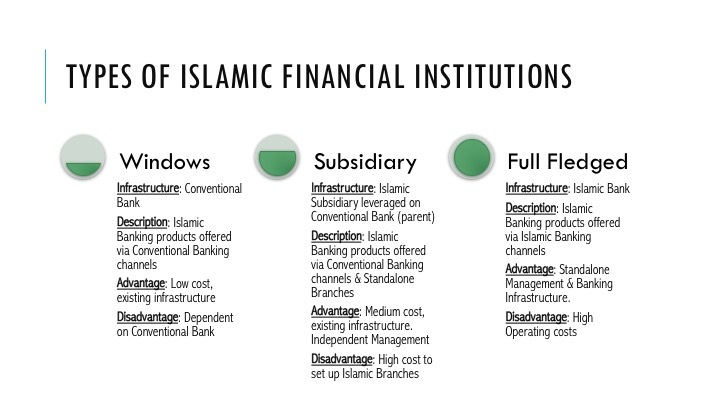 Not many banks operates under the Islamic Banking Windows model. The main reason is the lack of product range i.e. competing with conventional banking products of the same branch, and the small scale of business limited to its SCEL, and no autonomy of business decision which must be aligned with conventional products. 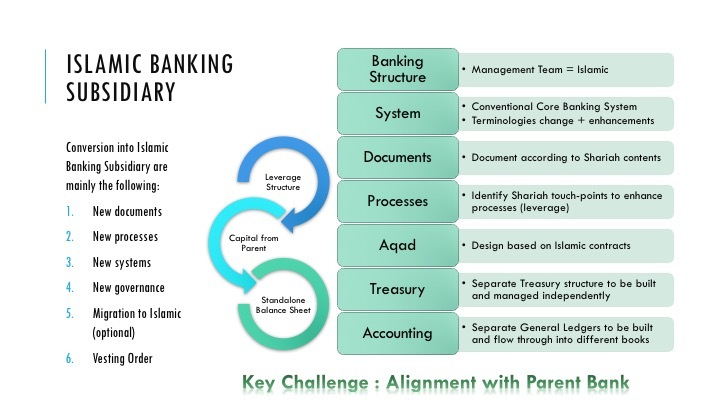 Islamic Subsidiary rides on the strength of the Parent Bank, which is the conventional bank. The model used is still a leveraged model, but the Islamic Subsidiary can choose which services or function they want to “outsource” to the conventional bank (at a fee chargeback, of course). The idea of a Subsidiary is to be independent, so all cost consideration must be taken into account. Decision to open Islamic Banking Branches can also be made, and BNM supports this expansion via Islamic Banking Branches. However, being a Subsidiary Bank can also be a burden to set-up. A differentiated system or process or operation team requires cash for its set-up. At the early stages, such investment cash will be limited, and when cash is available for investment, the development of the Subsidiary Bank must then align with the conventional bank. So it can be a chicken and egg situation where to expand you need to earn but to earn you need to expand (and spend). Most of the conventional banks offers Islamic products via Islamic Banking Subsidiary. The main advantage is that decisions are autonomous in a Subsidiary, there is more control of marketing and sales and branches, and the Bank (as an independent entity) can chart its own course. However, there will still be influence from the parent (as the majority shareholder) and the products and services offered are generally aligned to the products and services offered by the parents. The SCEL for Subsidiaries are also dependent on the strategy of the parent Bank, where it can choose to invest heavily or adequately for the operations of its subsidiary. These are standalone banks that generally are not under any conventional banking influence. The products and services may be consistent with the offerings in the market, but it is not an obligation to follow. In theory, Full Fledged Islamic Banks have the capacity to offer new-to-market products, based on the approvals obtained from Shariah Committees and BNM. 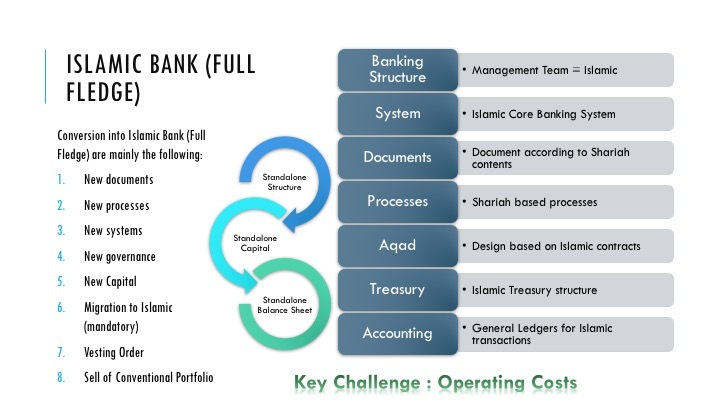 There is room for innovation and experimentation of new structures via Full Fledged Islamic Banks, although they must still governed by the financial ratios and controls for other types of banks and financial institutions, using conventional measuring tape which could lead to a “penalty” cost for doing business. For example, a debt based home financing based on Tawarruq will incur a capital charge of 50%-100% but in a Musyaraka Financing, that capital charge will cost 100%-400% which will be an “expensive” proposition simply because it is measured against conventional financial ratios. Personally, I believe Full Fledged Islamic Banks should follow a different set of financial ratios catered to reflect the type of risks an Islamic Bank CAN take, should the Islamic Bank look to offer products such as Mudaraba, Musyaraka, Istisna’ or even Salam. To allow for pure innovation, the financial ratios and treatment of capital and assessment of risks should be differentiated to reflect the nature of the products offered. While Basel requirements can be used as benchmark to ensure stability, an “Islamic” Basel will be even more meaningful where it can fully address all the real risks faced by Islamic Banks deploying Profit Loss Sharing (PLS) and equity-based structures such as Mudaraba and Musyaraka. Slowly, BNM is recognising these differences for measurement and has taken small steps to differentiate, such as the introduction of treatment of Investment Accounts (IA), the Liquidity Coverage Ratio (LCR) treatment, Capital Adequacy Framework for Islamic Banks (CAFIB), and the removal of Reserve Funds (reserves from paying of dividends) from Islamic Banks recently. It is my sincere hope to one day see an “Islamic” section in future Basel releases as well. The main challenge for a Full Fledge Islamic Bank, is the costs of building the franchise from ground zero. 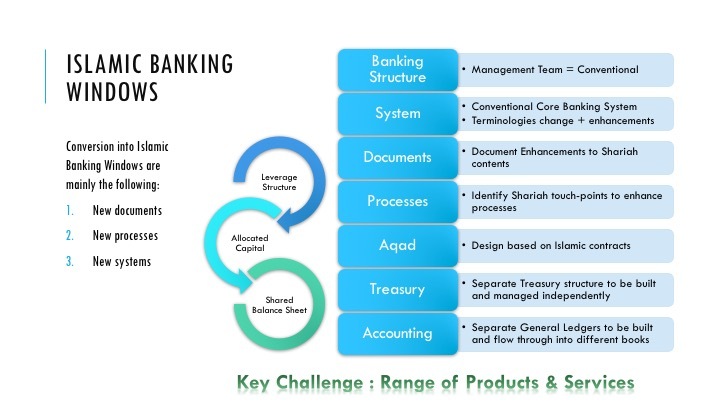 To compete with a conventional bank, the Islamic Bank must invest similarly in its infrastructure and achieve operational efficiency and scale as soonest as possible. The payback period and Return on Investment and Return on Equity remains important for long term sustainability. SCEL is dependant on how big the Bank intends to grow. Another key consideration is the ability for the Islamic Bank to build a strong source of cheap deposits for the funding requirements. Of course there are other structures that can be attributed as Islamic Financial institutions such as cooperatives, development banks, and investment banks. But the most common are the above variations and these structures fit into strategies identified by the bank. In most cases, BNM prefers to see development coming from the Full Fledged Islamic Banks and Subsidiaries. These should be the drivers for the growth of Islamic Banking. This entry was posted in Article in Islamic Finance, Bank Negara Malaysia, Banking Model, Islamic Banking, Islamic Banking Contracts, Malaysia, Tawarruq and tagged Islamic Bank, islamic banking models, islamic banking windows, islamic financial institutions, islamic subsidiary by Amir Alfatakh. Bookmark the permalink.